Father's Day is just over a week away! Have you shopped for all the dads in your life? 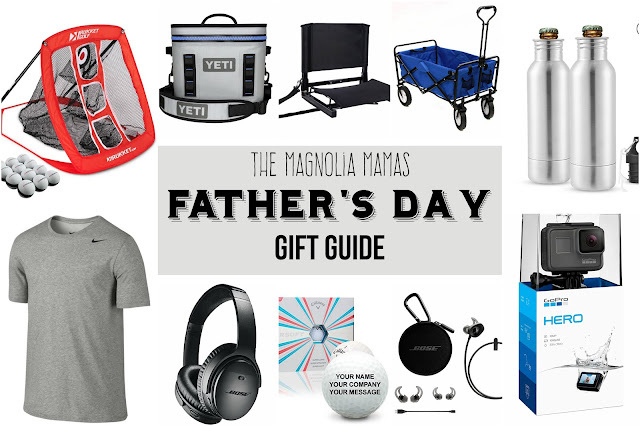 From our own fathers to our husbands who are amazing dads to our our little ones...we want to show them just how much we appreciate them with some amazing and fun gifts! We've polled lots of guys and come up with what we think is a pretty good list of gift suggestions for Father's Day! +Bleacher seats - No more uncomfortable hours watching sports. These bleacher seats are sure to be used every weekend dad is watching his little athletes. +Collapsible sports wagon - Let's be honest...who carries all the stuff needed for games and practices? Dad! Help him get all the gear where it needs to go with this collapsible sports wagon. +Personalized golf balls - Does the dad in your life love to golf? Gift him with personalized golf balls! You can select a short note or message on the balls that will remind him of his kiddos every time he goes to swing. +Chipping Net - Does he need to brush up on some skills or just want something to do out in the yard? This chipping net is the perfect way to practice! +Hammock - Dads work so hard, don't they deserve a little rest now and then? Whether the dad in your life is adventurous or not, who wouldn't enjoy a nap in a hammock? +Bottle insulator - Have a dad that likes to enjoy a cold one every now and then? Keep his drinks cold with this stainless steel bottle holder. +GoPro - Dads love taking kids on adventures and sometimes they want to document all of that fun! The GoPro allows dads to record video and take pictures in the most extreme circumstances! +Yeti Cooler - Off on an all day adventure, over night camping trip, day at the beach or just about anywhere, cold drinks are a must! Yeti coolers are built to be the best and this hopper size is just perfect for any type of outing. +Wireless Headphones - Most dads love to put on headphones and tune out. Whether he is off on a run, in the gym or just mowing the grass, wireless headphones make easy to turn up the tunes! +Dri-Fit Tees - Father's Day being in the summer means there are lots of hot sunny days ahead. Help dad stay cool with Nike Dri-Fit Tees! We're always looking for new ideas so if anyone has any great gift ideas for Father's Day this year, please share in the comments! What do the guys in your life want for Father's Day this year?